Making homemade almond milk is so simple and affordable that it’s really unnecessary to buy it in the grocery store. It’s worth trying to make at home, at least once, so you understand the difference between homemade almond milk and shelf-stable almond milk from a carton. When you make almond milk at home, stripped to its bare essentials (nuts, water, and a little salt), it becomes more than just almond water. However, my first couple attempts at making almond milk at home weren’t all that successful. My almond milk definitely didn’t taste “heavenly”, or “delicious” as everyone claimed homemade almond milk to be. It definitely couldn’t stand up to the store-bought variety I was used to buying. On the contrary, the almond milk was sour-ish, grainy, and separated as soon as I poured it into my tea. After A LOT of testing and experimenting, I finally figured out how to make my almond milk taste unbelievably good. If you’ve been making almond milk at home for a while and you’re happy with the results, that’s great! Keep doing what you’re doing, but if you’ve been disappointed with your homemade almond milk and went back to store-bought, I encourage you to read on. Perhaps you’ll find some of the following tips helpful and give your homemade almond milk one more try. I promise. This time, it will taste “heavenly” and “delicious”. You really need to start with raw almonds. Roasted nuts are dry and brittle, making for a less-creamy milk. It also highlights their bitter undertones, whereas raw nuts are sweeter. Also, do not peel the almonds. I’ve tried making almond milk from blanched almonds, but found that keeping the skins on actually helps to reduce the grittiness of the almond milk. Counter intuitive, I know! Remember that the taste of almond milk reflects the taste of the almonds. So, get high-quality, organic, fresh almonds. 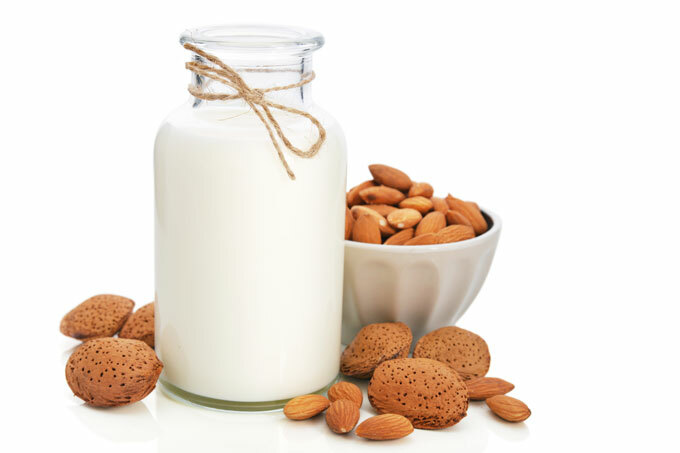 If your almond milk tastes sour or the flavor is too intense and unpleasant, the almonds are most likely the culprit. Nuts go bad faster than you’d think, and nowhere is that “off” flavor more apparent than in a batch of nut milk. I used to have this problem all the time when I was buying almonds from a large supermarket. Ever since I started buying almonds in a local health food store, the results are incomparable. So, if you don’t like the taste of your homemade almond milk, try buying nuts from a different store. To keep raw nuts fresh longer, store them in the freezer or in a cool, dark cupboard in an airtight container. Since almond milk is mostly water, clearly the water you use will also have an impact on the taste of your almond milk. At the same time, there are some regions with exceptional tap water. So, it really comes down to your specific geographical source as to whether filtering offers any real benefits. My tap water has an alkali-esque quality in the aftertaste compared to filtered water which has a much brighter and sweeter flavor to it. As for my almond milk, the results were similar. The almond milk made with filtered water was a little sweeter and acidic in taste while the tap water produced almond milk slightly more basic with a metallic aftertaste. For best results, soak the raw nuts for at least 12 hours before blending. Soaking saturates the nut from the inside-out, resulting in a smoother, creamier texture. It also yields more liquid because fully saturated nuts blend better and leave less “pulp” behind. I soak my almonds in the fridge to make sure they remain nice and fresh. When I’m ready to make the milk, I discard the soaking water and rinse the almonds really really well before adding them to the blender. Also, once the almonds have been soaked, they can’t stay out of the water for too long, even if they are in the fridge. They go sour really fast. So, blend the rinsed almonds right away. High-speed blenders are a must-have when it comes to making nut milks. They blend so thoroughly that they break down cell walls, making the almond milk incredibly smooth and creamy. The ratio of water to almonds is totally up to you. Start with a ratio of 1 cup (145 g) almonds to 2 cups (480 ml) water. If you’d like a thinner milk, use more water next time; for thicker milk, use less. Thin and light for your breakfast cereal, creamy and rich for your coffee, or mildly thick to enjoy straight from the glass – you can make the exact consistency you like. My go-to ratio is 1:4. As far as straining the milk goes, it’s up to you as well. If you plan on cooking with the milk (say, using it for curries or for simmering whole grains), you don’t even need to strain it. If you want to use it for your morning granola or just to drink it straight from a glass, strain it through a nut milk bag. I used to use cheesecloth, but didn’t find them very practical. It always came apart (unless I doubled it or tripled it) and was impossible to wash. Nut milk bags work so much better because they are already bag-shaped, don’t stretch over time, are resistant to picking up stains or food odors, and can be machine washed. Finally, the one “problem” with homemade almond milk is that is has no viscosity. Straight from the blender, it has the perfect flavor, but none of the creaminess you expect from milk. The main reason for this is that this milk doesn’t contain any stabilizers and emulsifiers to help it maintain a uniform consistency and emulate the thick milk. That’s why homemade almond milk separates as it sits in the refrigerator. The good news is that there is a way to naturally thicken and homogenize homemade almond milk. Bringing the almond milk to just under a boil for a few minutes permanently increases its viscosity. While I would love to take credit for this “discovery”, you’ll have to thank Andrew from One Ingredient Chef for this. Homemade almond milk that's delicious, customizable, easy to make, and doesn't separate. Great for drinking straight, pouring over cereal, or baking. Blend the soaked almonds, filtered water, salt, and any optional add-ins in a high-speed blender until all the almonds have broken down and the mixture becomes frothy. A Vitamix can handle a full batch, but you might have to do more batches with smaller blender. Pour the contents of the blender into a nut milk bag and strain it. Squeeze every last bit out of the pulp. All you should have left is nearly a dried ball of almond meal. Pour quarter of the almond milk into a large saucepan. Turn up the heat and stir constantly until the milk reaches a high temperature (right before a boil). Once the milk has thickened (it will happen almost instantaneously), remove it from heat and mix it with the rest of the almond milk. Transfer the milk to a jar or a bottle and refrigerate. The milk will keep for up to 4 days, though best when fresh. *Soak the almonds for at least 12 hours. Keep them in the fridge so they stay fresh. Once soaked, drain and thoroughly rinse. **Save leftover almond meal and toast it in the oven. You can then blend it into a smoothie, bake with it, toast it in the oven and sprinkle on top of oatmeal, or dehydrate it and use it as breading. ***Prep time does not include soaking the almonds (12 hours). Hi Tom. To be honest, I’ve never used flour sacks before. I know of them, but don’t own any. However, I don’t think that they would cause the almond milk to separate – it doesn’t matter whether you use cheesecloth, nut milk bag, or flour sack – they should still work the same. When you’re talking about the second batch of almonds sitting for more than 24 hours, are you talking about the almonds soaking for more than 24 hours? My last batch of almond milk separated. I had soaked the almonds overnight, couldn’t make milk until later that day. I had them drained in the refrigerator and the batch made from them seperated. I’m thinking that was a bad thing! Same almonds, same water, never seperated before. I haven’t made a lot of batches, but never had problems. The almonds soaked overnight in the fridge, then in the morning when I couldn’t blend them, I strained them and put them back in the refrigerator for probably 10 hours. I’ve read that they can sour quickly left like that so maybe that was where things went wrong? You are helpful, I need better scheduling for my milk making! Will make some this weekend, the right way! Thanks, have a great weekend! I definitely have had the experience of separation coming from lower quality, or simply unrefrigerated almonds. We have a store here that keeps all of it’s nuts refrigerated. Those nuts always do better at not separating than nuts bought off the shelf. Dear Petra, thanks for your advice! I just wanted to ask you one question – why should one only boil a 1/4 of the milk to increase viscosity? Thanks! If people are using mason jars and have a sous vide stick, you can just pop it in the bath for 2-4 minutes at 80-90C, depending on desired thickness and it’ll do the same thing. Don’t add spices and vanilla before this step. Do it after, instead, once the milk cools off in the fridge. That’s so interesting! I have never even thought about it. Thank you for sharing. I am sure some people will find it very helpful. Such great instructions! My problem is when i try to strain milk- I get no pulp- it’s all blended?! I use Vitamix at a highest setting for a bit under a minute. 🙁 It tastes good but almost chalky! :/ Not like the ones I bought from juiceries before. Wow, I’m so glad i found your YouTube channel and blog! 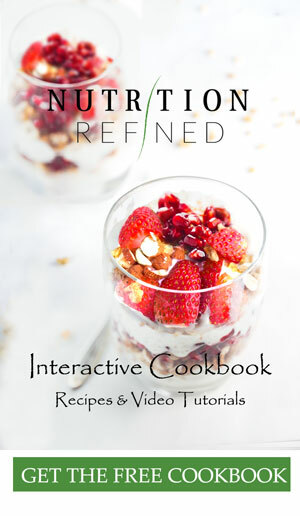 So grateful for your detailed well made tutorials <3 Thank you for all the work you do to share these recipes with us. Your almond milk recipe is the first i find that does not require the almonds to be blanched (peeled), i was wondering if there was a difference? Does keeping the peels make it more bitter or nuttier? I definitely would prefer not to take the extra step to peel them haha. What are your thoughts? 1. 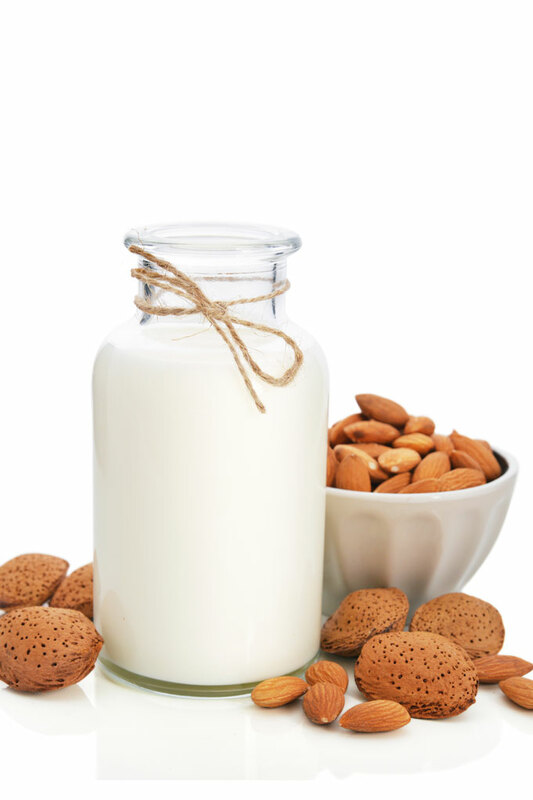 Milk flavor – blanched almonds give a less intense flavor to the almond milk. 2. Almond pulp – when you use blanched almonds, the leftover pulp (almond flour) is light in color and lacks the dark specs of almond pulp with skins (almond meal). For delicate (light-colored) baked goods you would want to use almond flour as opposed to almond meal. I made almond cashew milk. It was perfect my favourite so far. I left it in the fridge overnight and it got clumpy and viscous. I tried shaking it up to know avail. I poured bit iin my tea and it appears to have gone sour overnight! I was so disappointed. Any idea what could cause this to happen? I’ve got a bad batch. The milk got separated heavily (2 layers with water in the middle) and smelled bad just after few days (made on Sunday evening and throw them off on Tue evening :(). Any idea? Also I wonder how long the milk could be kept at its best quality? I stored them in an Tupperware airtight bottle (not made of glass), is this the problem? Do we really need to strain/boil the milk? Hi – I am so sorry to hear that. Let me ask you a few questions: 1. your milk separated into 3 layers – milk-water-milk? 2. You’re asking if you need to strain and boil the milk so I assume you didn’t strain it and/or boil it? If you just blend almonds with water and do not boil portion of the milk, it will separate because there are no additives. The reason store-bought milk doesn’t separate so much is because there are usually emulsifiers, stabilizers, and/or thickeners to keep the milk from separating. 3. Homemade almond milk should last in the fridge for at least 4 days. 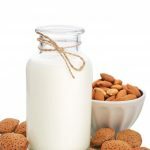 There are several reasons your almond milk could have gone bad – how long did you soak the almonds for? Where did you soak the almonds – in the fridge or on the counter? Also, you have to make sure your appliances and kitchen tools are clean (even better – sterilized) so there are no bacteria that could ruin your milk. I know this is a lot to take in, but hopefully we can figure out what went wrong together. I didn’t realize till recently that all almonds sold in the USA are treated, due to a salmonella scare back in 2007. I now buy organic almonds in bulk from Spain through Amazon. People use almond milk for a healthier lifestyle and our gov’t. is spraying them with Propylene Oxide! My almond milk always separates, but I just shake it before using and it’s fine. I use it for smoothies, so it doesn’t need to be perfect, and I also no longer strain mine, for added fiber. I hadn’t read anywhere about heating 1/4 of the milk – that’s a fantastic idea for a creamier milk, thanks! Thank you so much for sharing! That’s some valuable information (especially for those living in the US). Thank you! Thank you! Thank you! I’ve been trying my hand at almond milk for a couple of months now and the most frustrating part of it was texture. Either I dropped the nuts:water ratio to 1:3, thus making it way more expensive than store bought (almonds cost about $14/pound in Rio de Janeiro), or I had to make do with a watery, albeit tasty, drink. Heating part of it up fixed the problem for me. Thank you! Hi Petra, I’ve always had trouble getting the right consistency when it comes to nut mylk. Thank you for the recipe, I think boiling a portion of the mylk will solve that problem. Your recipes are amazing. Thank you again. Keep posting your amazing vegan recipes. hi Petra, can I soak the almonds a bit longer? As the milk will stay just for four hours. Hi Rasha, yes, you can. You just have to be careful if you soak the almonds longer that they don’t go bad. I would either put the almonds in the fridge after a few hours or at least change the soaking water a few times. I am from Mexico, United States border, I love raw foods, thank you for teaching me, it is very good for my health. Hi, I’m curious too know if you have tried the boiling technique with oat milk at all? Oats react differently to other nuts and my first batch was a little slimy and separated quickly. Next time I’ll try without soaking the oats beforehand, I read that can help. Hi Ali – getting the oat milk consistency right can be a little tricky. Usually the problem with sliminess has more to do with the actual blending (rather than soaking/not soaking). If you blend the oats for too long, the milk does tend to get slimy. Ideally, you wouldn’t be blending the oats for longer than 45 seconds. Also, you want to use rolled oats (not instant oats). I am not sure which oats you used, so I thought I would mention it. You don’t need to have the oats perfectly blended (that’s what causes sliminess). Rather, use a nut milk bag to strain the milk. It has been quite some time since I made oat milk (my husband prefers almond milk, coconut milk, and cashew milk, so those are the ones I make at home regularly). So, to answer your question – no, I haven’t tried the heating method with oat milk. Please, let me know how it goes if you give it a try. I’ve tried 3 times now heating a little of our milk just as you instructed. Each batch of milk has “curdled” when I mix it with the remaining milk. Each time I did the heating process right after making the milk the water was room temperature cool not super from the refrigerator. I read that temperature shock can cause this effect? I’m not sure if I’m doing something wrong. Or if I’m ruining the milk. Afraid to give it to the kids like this in case I’m spoiling it. Hi Marissa – so sorry you’re having difficulties with the recipe. I have never had this happen, but here are a few things that come to mind. 1. Heat the almond milk gradually, over low to medium heat. This is important because you don’t want the milk to boil. It just needs to reach a high temperature (almost boiling). 2. Temperature shock can definitely cause milk (any milk, really) to curdle. My almond milk is always warm from the Vitamix. It shouldn’t be cold. If you mix together hot and cold milk, it will indeed curdle. 3. The last thing – which I am sure you’re aware of – is acidity. If you add anything acidic to the milk (lemon, apple cider vinegar, coffee …), the milk will curdle. It doesn’t mean that the milk went bad. You can still drink it, but it’s not very pleasing to look at. Hope this helps a little. Please, don’t hesitate to reach out if you have any questions. Can I send this to school with my son for lunch in an insulated bottle? HI Obi – I just realized you mentioned an insulated bottle. I guess it depends on how long your bottle keeps liquids cold and how quickly you son drinks the milk. Ideally, the milk would stay cold. I’ve seen on your website that you are using cashew milk quite often. So my question is: would you use the same quantities to do it 1cup of cashew for 4 cups of water? and then can I use the same technique (warm some part of the milk) to thicken it? Thanks for all your recipes and videos. Thank you so much for your answer and the information. The idea is to make an ice cream, so I will try to use the ratio 4:1 … or maybe 3:1 to make it a little bit “creamier”!